This page will get updates as new items get posted. Don’t want to miss ANYTHING? subscribe to the blog via email at the bottom of this page. Want more free gear and exclusive content and pricing? Sign up to the Fail Squad Games Guild (Upper Right of this page) Right NOW! Your first discount code is waiting! 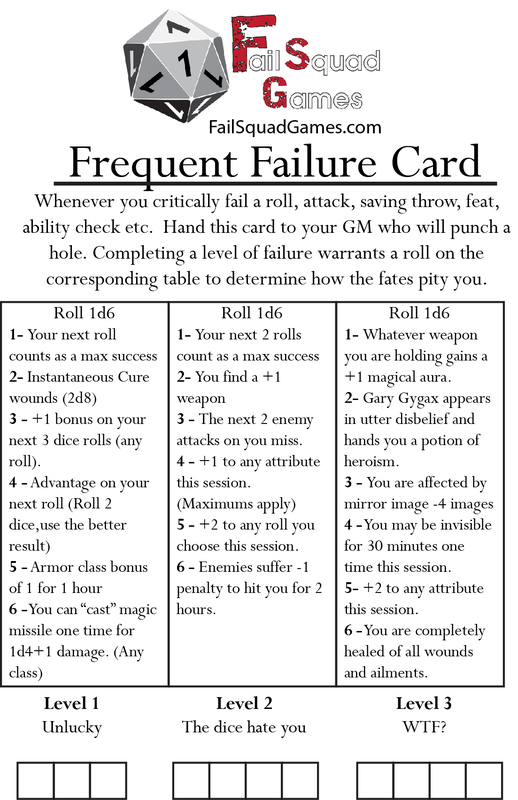 Frequent Failure Cards are punch cards for the pitifully doomed Fail Squad Professional who seems to ALWAYS fumble. A fun GM tool for home or conventions. Get your Free Frequent Failure Card HERE!